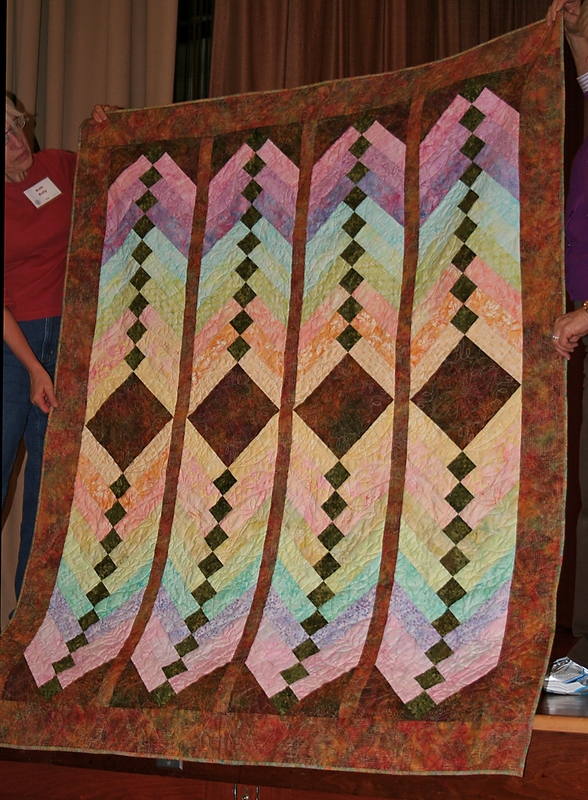 Last week I attended my local quilt guild meeting and had a good time. It’s always nice seeing my friends, and I managed to purchase a package of lace from Donna’s sale table. I’m supposed to be destashing, but I could not resist those laces. 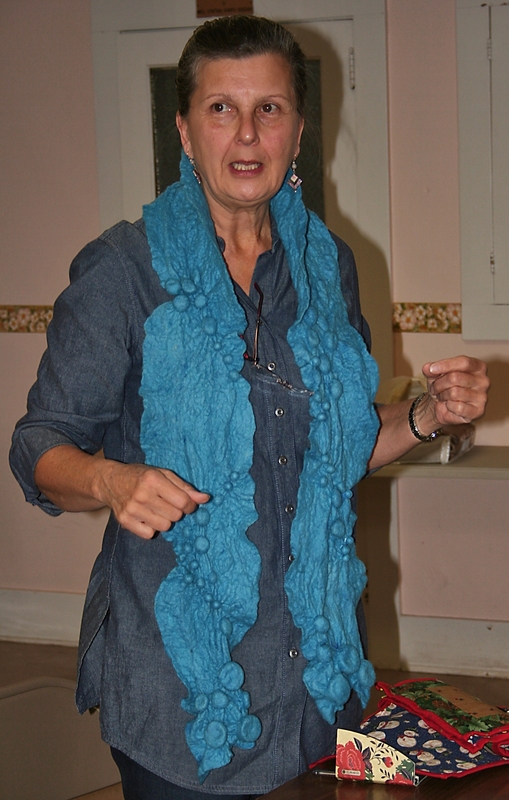 She teaches at Sew Creative and her easy curved class has been taken by many members. Is that not gorgeous? 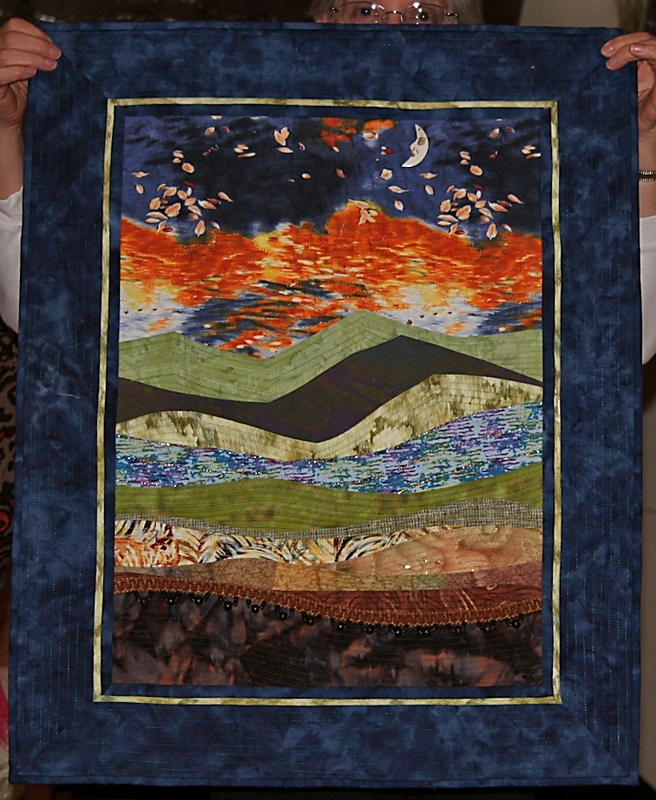 It’s made entirely out of silk dupioni, and has lots of lovely texture. 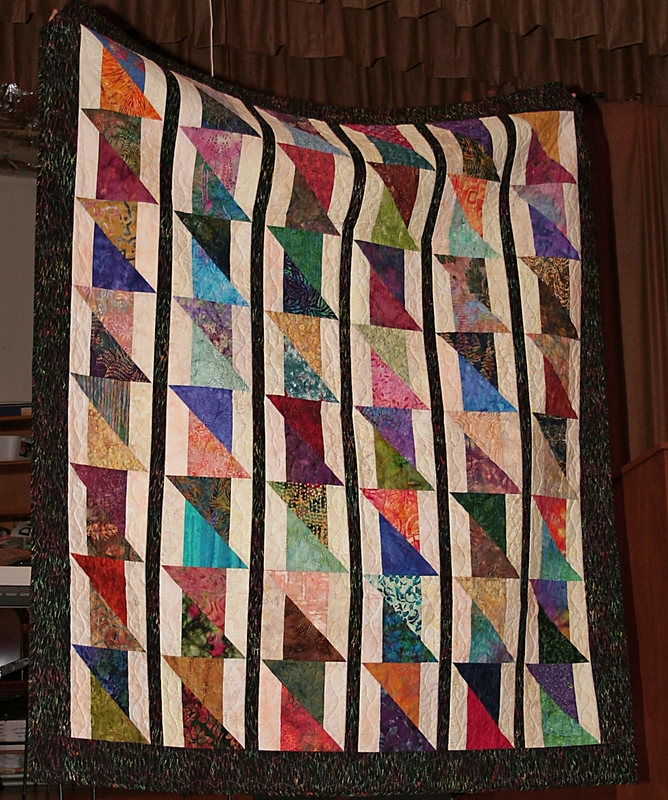 The colors were so soft and were shaded so expertly, I just had to post a picture of this quilt. At first glance, I thought that isn’t quick and easy to make, and then I realized it actually is. All you do is get a strip of light colored fabric and sew squares along the edge. Trim to create new squares, and then cut along the diagonal. Mix up the sections and sew them together again. There are no fussy seams that have to be matched, and that is always appreciated. Our speaker was Randall Cook. You can click on his name and be directed to his website to see really good photographs of his work. I moved to the back of the room to sit with friends, and my photos came out LOUSY. Yes, all capitals. The photos were that bad. The room lights kept on getting turned on and off, and my poor camera couldn’t handle the changes. I’d be taking a photo with the lights off and bam, the next thing you know, the lights were back on. I finally gave up, relaxed, and enjoyed listening to the lecture. After the lecture we had time to look closer at his quilts and I was really surprised by something Randy had done with his quilting. 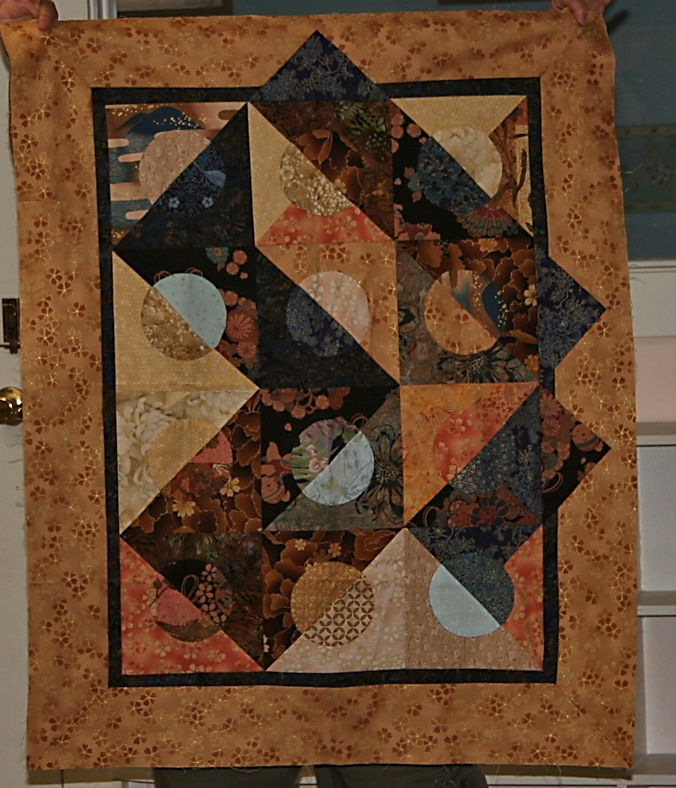 He had quilted an area with a filler stitch. Okay, we all have done that, but then he went over that quilting with another design. I’ve never see that before, and it looked really good. It was texture on top of texture, and it’s always nice to learn something new. 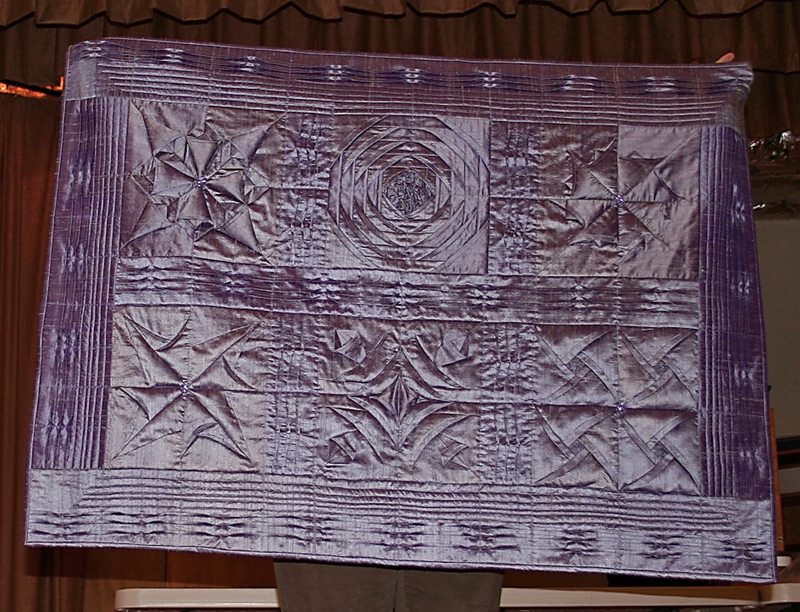 Another of his quilts had a crocheted lace border done with knit fabric. It was very cleverly done by slitting the fabric, then using a crochet hook to form a couple of rows of chain stitches up the center. 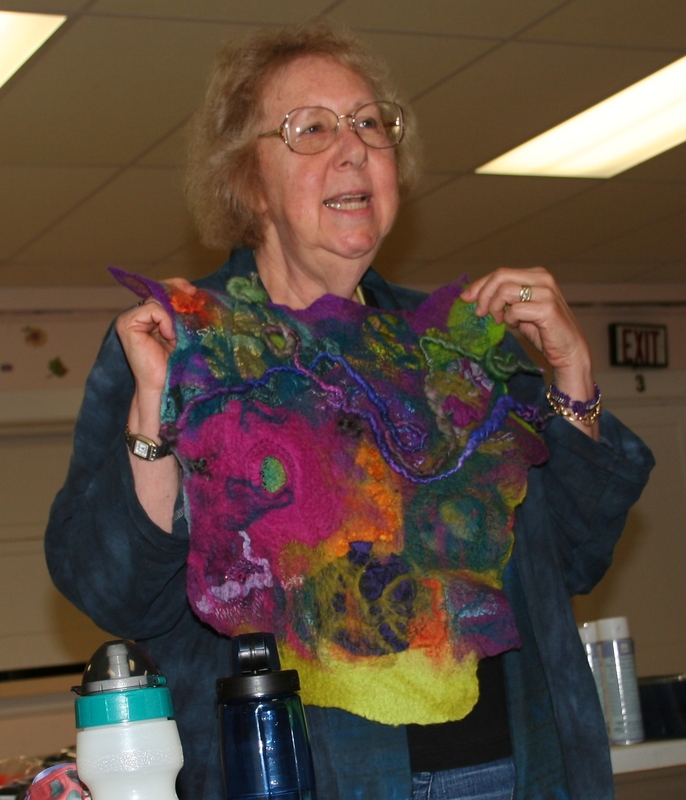 Belonging to a quilt guild is fun, a great opportunity to make new friends, and the icing on the cake is when we have great speakers who share their work with us. We learn from each other, and we get to see a wide variety of styles. I throughly enjoyed last month’s meeting, and I hope you enjoyed your visit too. You might not have been there in person, but it is fun looking at all the pictures, and going to all the links, isn’t it? I attended my first meeting of the Upstate New York Bead Guild today and enjoyed meeting and chatting with this talented group of beaders. Everyone was very friendly, and I got to see some lovely beaded name tags. 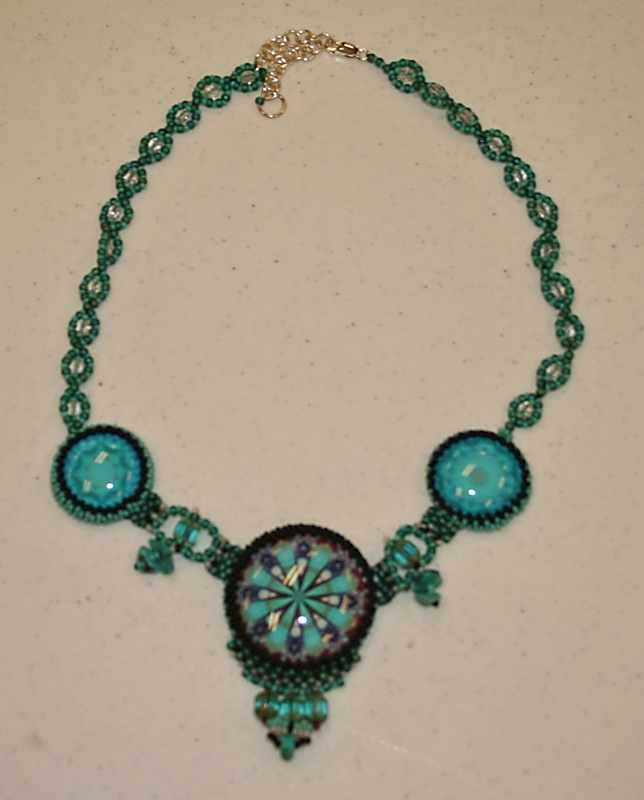 Lots of different techniques were used and I especially like the one with the stacked beads. It added lots of dimension and you could read her name easily too – good design and functional. You can’t ask for more than that. We each made a big cabochon in the middle. Everyone’s was different, and they were all gorgeous. I loved painting on copper, and was very happy I could wear something I made to today’s meeting. I changed it up a bit as the kit had silver jump rings and ear fasteners – the same silver color as the necklace fastener. 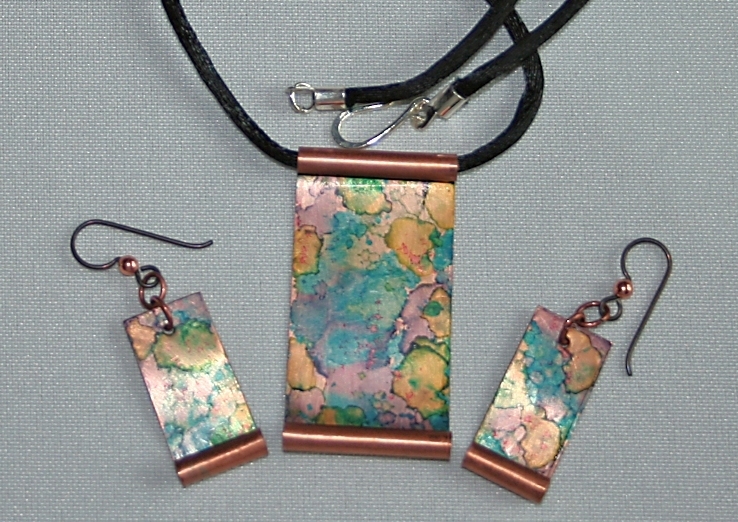 I purchased copper jump rings and found ear fasteners with a copper bead on them to pick up the copper on the roll. That simple change made my day. We had a good meeting this month and Show and Tell was really good. It’s gorgeous as a scarf, but I believe she will be using this felted piece as a jacket collar. I can’t wait to see that garment. This is a work in progress as she is planning on adding a lot more embellishment on the bottom half. 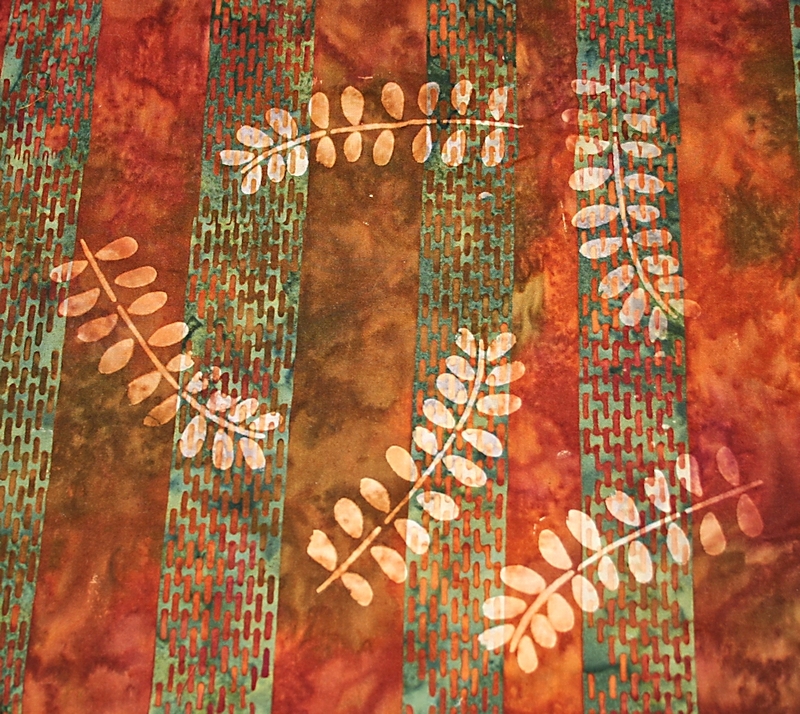 She got this design from Linda Kemshall – who offers design classes online. I’m not sure if she took a class with Janet Root or not, but she thanked Janet at the meeting, and Janet has made a series of quilts using this technique. 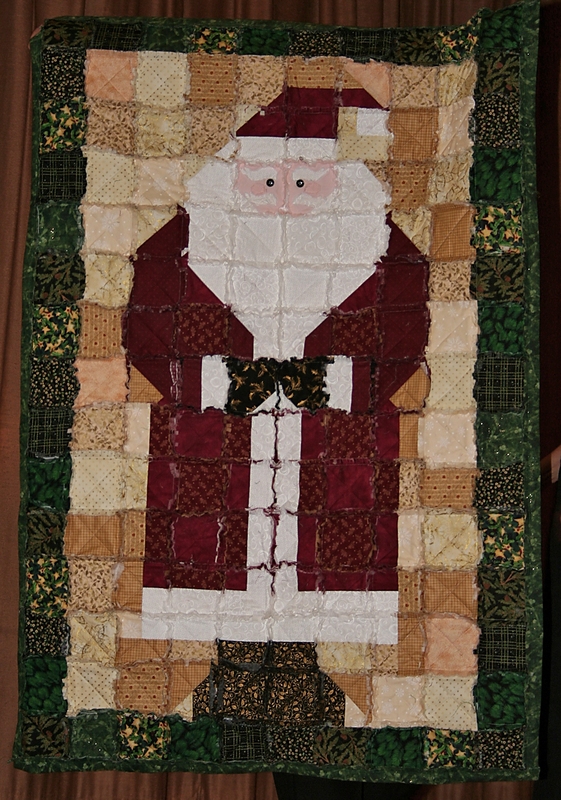 This has a lot of quilting on it with multiple thread types, and is also a work in progress. 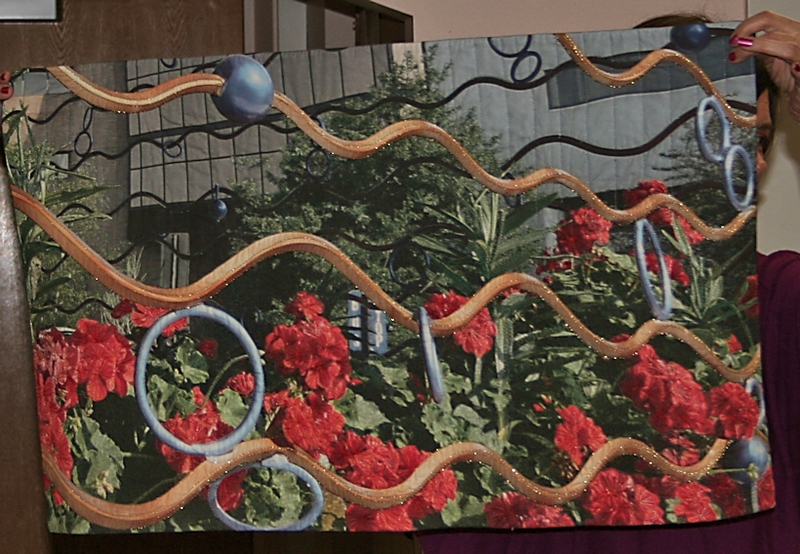 The next step will be adding some beads, and this will be in an upcoming exhibit. You can remove and add color all with one application. 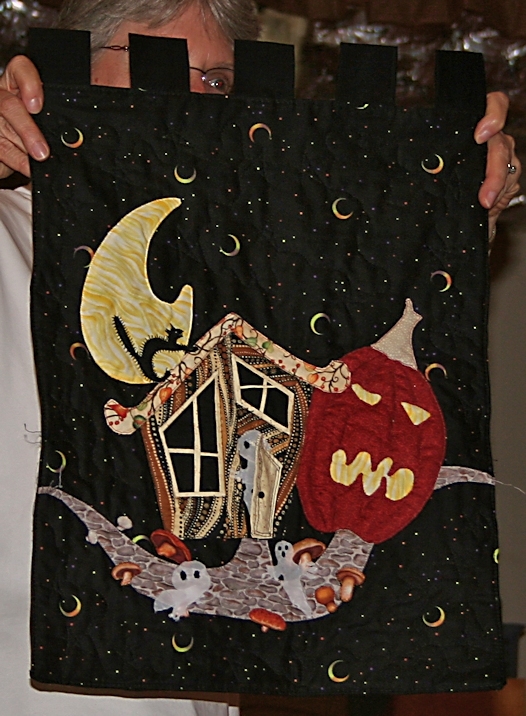 The base fabric was a batik, and a Martha Stewart stencil was placed on top of the fabric. The product was applied, dried, and then ironed. 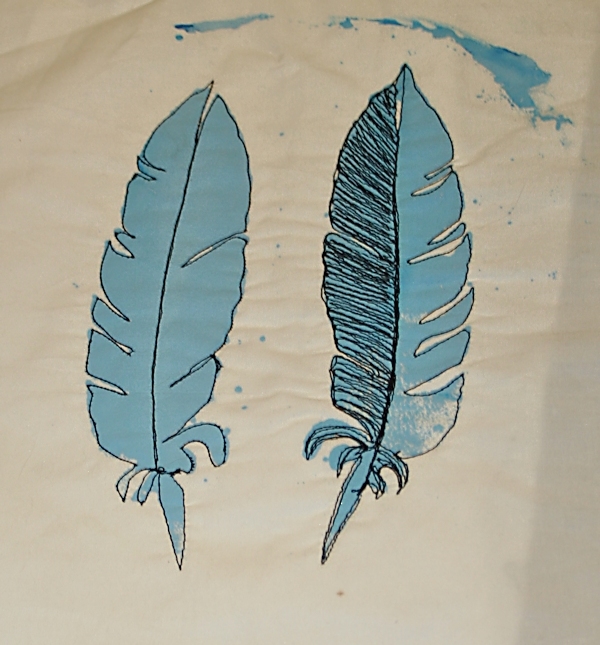 It stripped the color and left the stencilled design behind. Other pieces had color added to them, but this picture came out the best so it’s the one that made it on this post. We were told it doesn’t work on some solid black cotton fabrics. Donna had printed a design, and it looked fine until she put the piece in the washing machine. She ended up with a solid piece of black fabric. This is a product that will be making it’s way to my studio. I’d like to test it with some hand dyed fabrics and see what happens, and see if it can be washed at all. I forgot to ask that question at the meeting, and I prefer to have the majority of my work be washable.